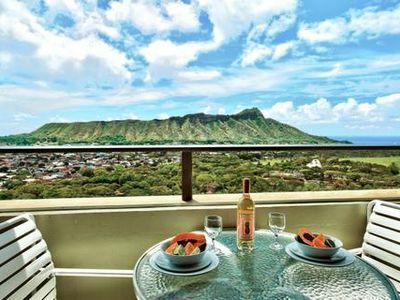 Penthouse at Chateau Waikiki is a modern penthouse vacation rental featuring captivating, unobstructed views of Diamond Head, the ocean, and Waikiki. 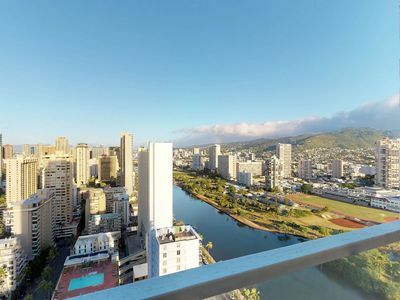 Be prepared to be mesmerized by dramatic views of the city at night alongside fireworks every Friday. 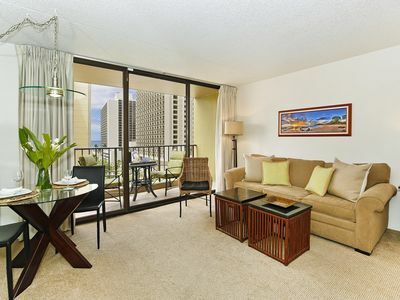 Guests will also love the prime location in the center of action. 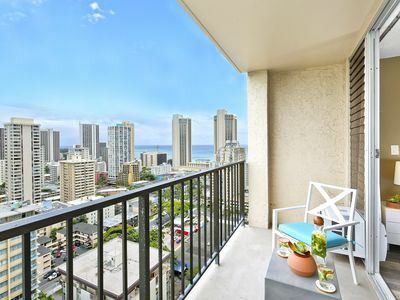 World class attractions such as Ala Moana Beach, Ala Moana Shopping Center, and the bustling nightlife of Waikiki are all within walking distance. 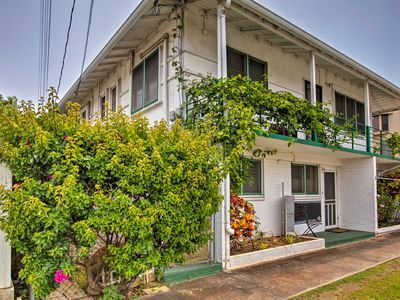 This unit is within a gated, security-monitored building and has 2 parking spaces. 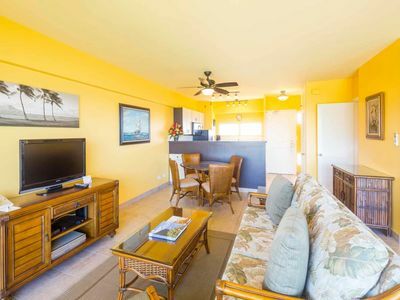 With 2 bedrooms and 2 bathrooms, this vacation home is perfect for a family or group of friends. 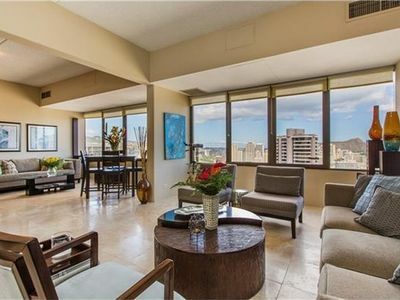 Upon entering, a bright open floor plan is arranged with expansive windows, offering a breathtaking view from nearly every room. 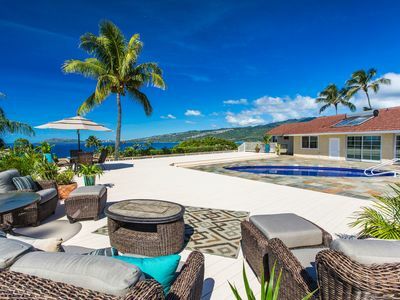 The open floor plan is built with a living room, kitchen, and dining area. Two sitting areas consist of the living room. 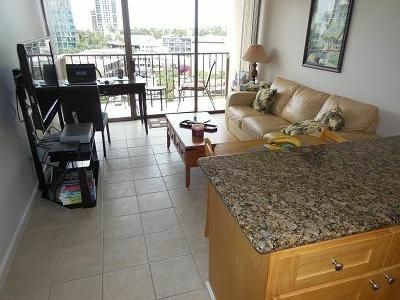 Plush seating options are placed in front of a mounted flat screen TV. WIFI and air conditioning are equipped for your convenience. Next to the living room is a top-of-the-line kitchen. 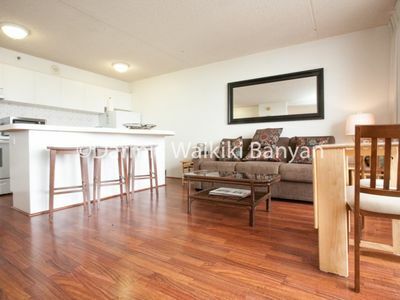 The kitchen is prepared with updated stainless steel appliances and granite countertops. 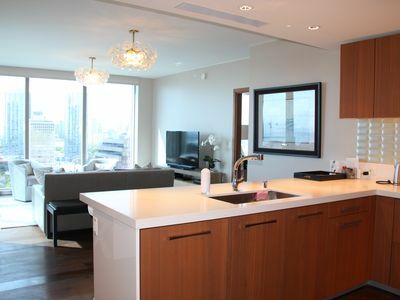 A chef will thoroughly enjoy whipping up tasty treats and mouthwatering dishes in here. Two seats are at the breakfast bar creating dining space and a handy way for guests to keep the chef company. When dinner is hot and ready to serve, call everyone over to the dining table. The dining table has seating for four. 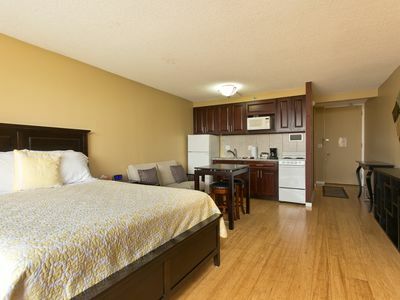 When you are ready to catch up on some rest, there are two luxurious bedrooms to choose from. 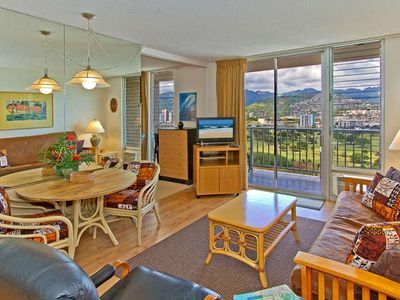 The master bedroom is furnished with a Queen-size bed, TV, and has a stunning view of Diamond Head. The master bathroom has a shower/tub combo and spacious vanity. 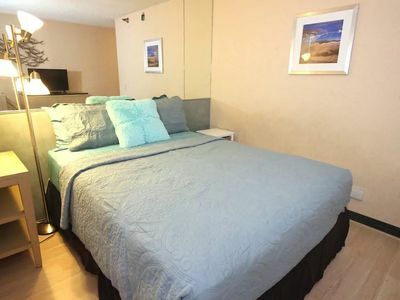 The guest bedroom holds a King-size bed, TV, and has sweeping views of the city. The guest bathroom has a walk-in shower and large vanity. 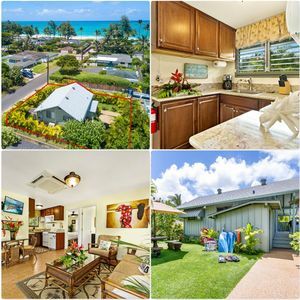 This vacation home also has a private washer and dryer - ideal for wet swimsuits after a visit to the beach or pool. 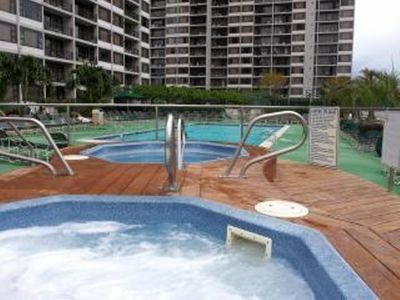 The resort itself has wonderful amenities to utilize during your stay. A well-equipped gym is available to work up a sweat. 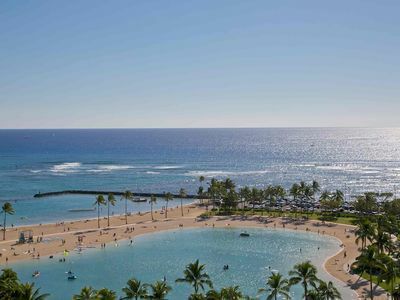 There is a swimming pool area with lounge chairs for you to soak in the Hawaiian sun. Gas BBQs can be found beside picnic tables if you are in the mood to dine alfresco. 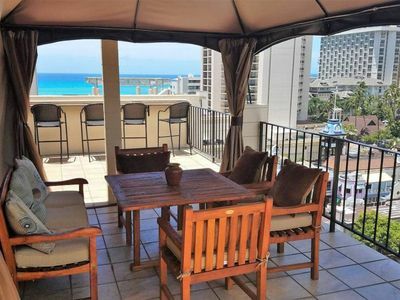 Last Min Booking Specials ~Perfect Location~Ocean View-Hot Tub~Steps to Amazing Uncrowded Beach! NEW! 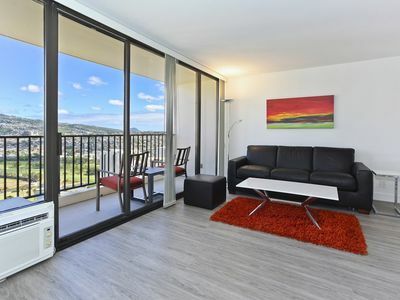 Honolulu Apartment ~ 1 Mi. 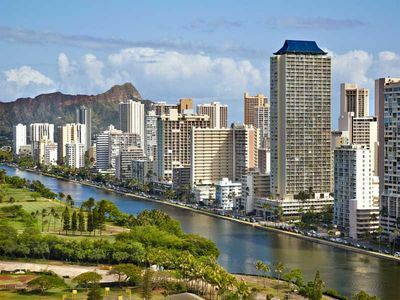 to Waikiki Beach! 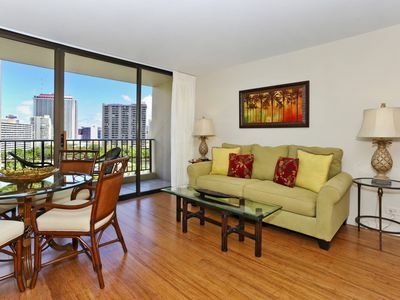 Spacious studio condo with private lanai, kitchenette and shared pool!